With Americans soon to begin choosing his successor, President Barack Obama is casting his seven divisive years as a time of positive change, implicitly asking voters to replace him with a Democrat who would continue his hard-won policies on health care, climate change and Iran. 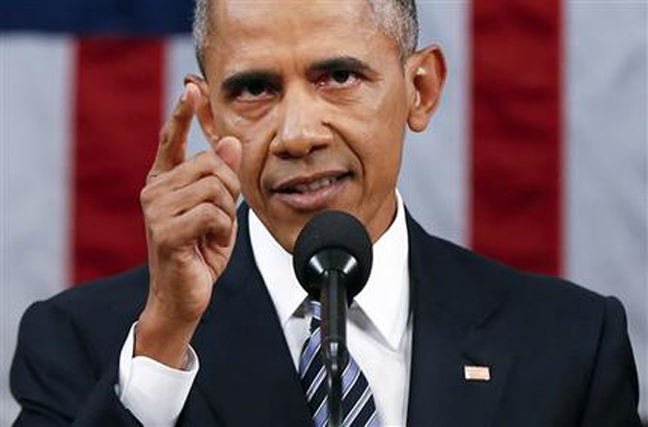 Addressing a hostile Repub­lican-led Congress and a country plunged in a tumultuous, at times angry presidential campaign, Obama used his final State of the Union address to summon an affirmative vision of his administration and for the future. He rebutted critics, naysayers and the GOP White House hopefuls, but also acknowledged his own failure to transform the country’s bitter politics and unite the nation. With a year left in office, he presented that task as more urgent than ever and pleaded with voters to turn away from harsh voices and come together. Conceding that changing Washington was not the job of one person, Obama called on voters to change the system itself by demanding less money in politics, fairly drawn congressional districts and easier access to voting. “There are a whole lot of folks in this chamber who would like to see more cooperation, a more elevated debate in Washington, but feel trapped by the demands of getting elected,” Obama told a Congress unlikely to follow his lead, though many lawmakers might agree with his call. “It’s one of the few regrets of my presidency - that the rancor and suspicion between the parties has gotten worse instead of better,” the president said. At times, Obama referred sarcastically to the Republicans running to replace him, though without mentioning them by name, just weeks before voting in Iowa and New Hampshire. He countered the negativity of Donald Trump, who promises to keep out Muslims and “Make America Great Again,” and Texas Sen. Ted Cruz's vow to “carpet bomb” the Islamic State group. Referencing terror threats around the globe, Obama defended his own efforts fighting Islamic State militants, and said: “Our answer needs to be more than tough talk or calls to carpet bomb civilians. That may work as a TV sound bite, but it doesn’t pass muster on the world stage.” Cruz skipped the speech, though his primary opponent, Sen. Marco Rubio of Florida, was present. Shortly before the speech began, news broke that Iran was holding 10 U.S. Navy sailors and their two small boats that drifted into Iranian waters after experiencing mechanical problems. The development, which Obama did not mention, prompted criticism from Republicans about Obama’s hard-fought Iran nuclear deal, which the president extolled, arguing that “the world has avoided another war." Trump had his own rebuttal over Twitter, remarking: “The #SOTU speech is really boring, slow, lethargic — very hard to watch!” Congressional Repub­licans began filing out even before it was over. Obama addressed a Congress now run by emboldened GOP majorities already planning their agenda under a potential Repub­lican successor, starting with repealing the president's health care law. Behind Obama sat a new House speaker, Paul Ryan of Wisconsin, who last week celebrated sending legislation to Obama’s desk for the first time uprooting the health legislation. However, striking similar notes to Obama, Haley also warned against strident voices in the GOP railing against immigrants and others, a measure of the party’s profound divisions as it struggles to unite to keep Hillary Clinton or any other Democrat from replacing Obama. “During anxious times, it can be tempting to follow the siren call of the angriest voices. We must resist that temptation,” said Haley, the daughter of Indian immigrants. While Tuesday’s speech was light on the lists of proposals typical in such addresses, Obama had some, even confronting a Congress largely hostile to his agenda. He mentioned initiatives that are dead on arrival, including immigration reform and closing the prison at Guantanamo Bay, Cuba. But Obama held out hope that compromise could be possible — even from divided government in a campaign season — on issues like criminal justice reform and helping people addicted to prescription drugs. Obama’s vice president, Joe Biden, sat behind him. Obama alluded to Biden’s own loss of his son to cancer this past year in tasking the vice president to lead a new national effort to conquer the disease.